HostSlayer is a web hosting service that provides reseller hosting and VPS hosting plans. It is popular for the high quality of customer support that it renders its clients. The service has key features that can benefit your business, among these is a custom server panel, which allows you to reinstall your operating system to any of HostSlayer’s supported platforms. As the host uses WHMCS for setting up hosting accounts and billing, you can easily shutdown, reboot, boot or reinstall your VPS. What’s great about HostSlayer is that it guarantees uptimes of 100%, ensuring website speeds. It likewise boasts of a strong DDoS security system, which can cover up to 250Gbps. A sturdy firewall also protects your site against any DDoS threat without getting affected by lag. The service’s network is connected to a 1GBps port, making it very popular among game servers. The service uses SSD storage arrays with Radi-10, among the fastest and most robust storage technologies currently in use. With HostSlayer, it doesn’t matter what type of site you are running as it assures you of quality web hosting. It works for both businesses and individuals who owns personal blogs. HostSlayer’s VPS and dedicated servers are bound to suit you. Customer support can be accessed 24/7, with technical people on standby to address your concerns. The service comes at a variety of pricing models starting at $1.99/month. However if you want to give it a try first, a free trial is available. HostSlayer VPS hosting offers 100% uptime guarantee. The provider offers strong DDoS protection that covers up to 250Gbps and they have a lot of game servers hosted on their network. Customers benefit from the network because it is connected on a 1Gbps port and the servers are located in New Jersey. Plus, the service’s custom firewall stops all DDoS threats without any lag. How Much Does HostSlayer VPS Cost? This vendor uses SolusVM control panel that lets you reboot, shutdown, boot, and reinstall the VPS. Every company has its own characteristics, and may need a particular type of solution that will be fit for their business size, type of customers and staff and even specific niche they cater to. It's not wise to count on locating a perfect service that will be suitable for every company no matter what their history is. It may be a good idea to read a few HostSlayer VPS reviews first and even then you should remember what the hosting service is supposed to do for your business and your staff. Do you need an easy and intuitive hosting with only basic functions? Will you actually use the complex tools needed by experts and large enterprises? Are there any particular features that are especially beneficial for the industry you work in? If you ask yourself these questions it is going to be much easier to locate a trustworthy service that will match your budget. We realize that when you make a decision to buy Hosting Services it’s important not only to see how experts evaluate it in their reviews, but also to find out if the real people and companies that buy it are actually satisfied with the product. That’s why we’ve created our behavior-based Customer Satisfaction Algorithm™ that gathers customer reviews, comments and HostSlayer VPS reviews across a wide range of social media sites. The data is then presented in an easy to digest form showing how many people had positive and negative experience with HostSlayer VPS. With that information at hand you should be equipped to make an informed buying decision that you won’t regret. HostSlayer VPS hosting offers 24/7 technical support. What are HostSlayer VPS pricing details? A free domain is usually offered with shared hosting plans. This review is for HostSlayer’s VPS hosting services. HostSlayer VPS hosting offers 100% uptime guarantee. There is no info in their Terms of Services about compensation for downtime. There is no info about unlimited email addresses and the service offers unmetered bandwidth with its premium packages. Yes, it is a good hosting platform for WordPress. Yes, HostSlayer offers a free website builder for novices. 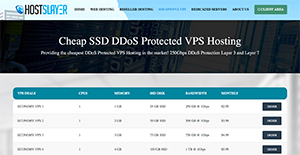 HostSlayer VPS hosting offers strong DDoS Protection that covers up to 250Gbps. Their custom firewall stops all DDoS threats. HostSlayer VPS hosting offers Linux hosting services. HostSlayer VPS hosting uses SolusVM control panel. HostSlayer accepts credit cards, debit cards, PayPal, 2Checkout, Skrill (MoneyBookers), Payza (AlertPay), Bitcoins, PerfectMoney, WebMoney, and cash. One of the best sellers for web hosting. I have 3 different accounts with them for different companies i have, so far i love them and my webmasters enjoy working with them. Best host i have found from LowEndBox. They provide extremely cheap ddos protection and their servers are fast. Encourage you to purchase one to try it out. One of the most legit companies that sells web hosting and vps hosting. Always on top of their game and assuring there is no abuse of their network. My honest review would be extremely long as I have been a witness on how the company has grew and became from nothing. But overall I suggest hostslayer to anyone who wishes to have a reliable owner who always checks up on the clients and actually has conversations. My name is Shawn and this is my history with HostSlayer. I found the company back in 2016 and bought my vps hosting. I saw how they grew and migrated from servers to servers due to expansion. I have never been more proud of a company that has true dedication. Good customer service, and very cheap prices. Recommend them to friends. Thanks to Hostslayer LLC, I made over $30,000.00 from my e commerce website! Best service for anyone who wants to spend $1 on web hosting. Cheap and gets what you want done. Pleased with their prices and support. The stable server so far has been Server2. Hope anyone who joisn them in that server. After been with them for 1 year, it is safe to say that this company has progressed so much from the start. Keep it up guys! Thanks to these guys I can finally have my website 100% up hence it used to get DDoS all the time. HostSlayer has helped me on setting up my vps as a game server for gary mod. I want to thank them. Its been almost 8 months with Hostslayer and I want to give them a great appreciation for the best service. im only writting this because they deserve some recognization of being a professional company. Im currently hosting my construction companys website with them and so far they have designed it and provided me 1year free hosting. A company that provides quality VPS at very affordable rate. VPS Uptime is always 100%, i highly recommend this specially for hosting game servers due to the reason that it has a strong DDoS Protection, really suitable for game servers. Support is too fast, you never have to complain about it, messaging them and getting a fast response, and thats what every customer wants!